The name Moon Rain came while watching a shower of meteorites fall over a full moon one summer night in the Gatineau Hills over 40 years ago, at the very beginning of my weaving time. 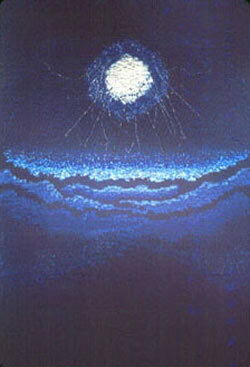 It inspired the rya tapestry, The Night the Moon Rained. During an exhibition of my tapestries at Museo Ixchel, the Museum of Textiles in Guatemala City, I learned of a Mayan legend that links weaving to the moon and the stars. Ixchel is the Mayan goddess of weaving, fertility and lunar cycles. “Moon” refers to the calendar, to the planting and harvesting of crops, and to weaving time. “Rain” refers to threads of inspiration and sacred knowledge that are woven into cloth to become the universal text of textiles. In Mayan culture the task of the weaver is a sacred one and weaving is older than recorded time. Located outside the quiet picturesque village of Poltimore in Val des Monts, surrounded by the geologically old rolling Gatineau Hills in the Outaouais region of Quebec, Moon Rain is a centre for tapestry weaving and teaching, and a place for creative retreat and renewal. In 1999 Moon Rain was incorporated as a non-profit organization dedicated to integrating creativity and harmony in the community through the creation, exhibition and teaching of tapestry arts. From 1999 to 2014, Moon Rain specialized in highly engaging community arts projects and developed a textile arts event, La Triennale Internationale des Arts Textiles en Outaouais, that has proven to be a major catalyst to the textile arts in the region and beyond. In 2015, to facilitate the future development of this event, the non-profit status was transferred to La Triennale Internationale des Arts Textiles en Outaouais. Moon Rain continues to be a collaborating partner with La Triennale.